Continuing our love the humble sandwich, today we introduce the delicious baguette 'Pan Bagna'. Now that's a lunchbox filler! 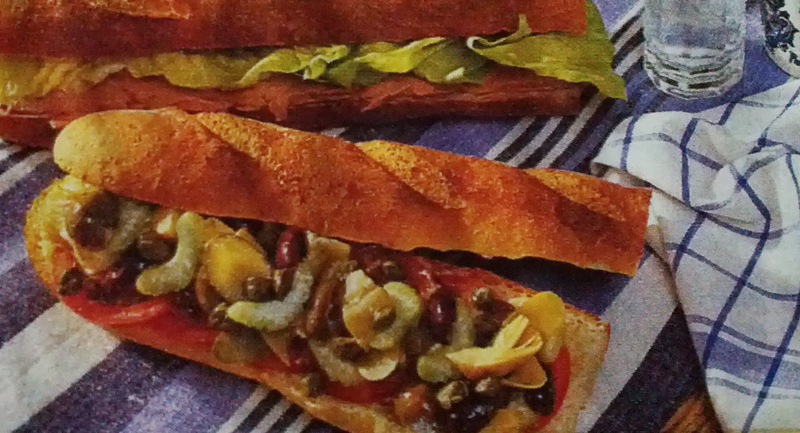 Split a baguette in half lengthwise and sprinkle the surface with good olive oil and a little red wine vinegar. Cover one half with tomato slices, anchovy fillets, pieces of marinated artichoke hearts, celery slices, olives, capers and gherkins. Sprinkle with salt and pepper to taste. Place the other half on top, wrap in plastic wrap until ready to eat.